What are specialty stores? Specialty stores are a place to go and receive extensive, dedicated, and welcoming services that do not include the click of a mouse while sitting at your computer desk or on your phone. Jim and Chase Donnelly are the proud owners and operators of Grand Slam Tennis and have been for 30 years! With the help of Jim's son Chase managing Grand Slam, Jim has had the opportunity to expand his interest in growing tennis. 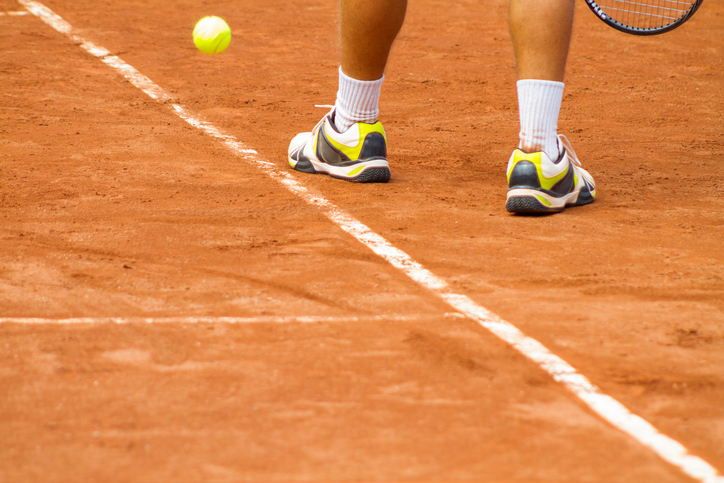 Grand Slam is a welcoming environment for any tennis player, whether you're a recreational, club or tournament level. Their services provide an array of possibilities: Tennis racquet, badminton, squash and racquetball re-stringing/re-gripping, tennis attire (women’s, men’s and children’s), tennis tutor ball machines (sales, services and trials), tennis nets, ball hoppers, tennis bags, tennis racquet sales, tennis sneakers, accessories, and a whole lot more. Grand Slam Tennis is 1,800-square feet of tennis equipment, with one side dedicated solely to tennis attire, and the other as pictured to tennis racquets, sneakers and four top of the line stringing machines. Your experience at Grand Slam Tennis is guaranteed to be different from any other store. The staff is very experienced, knowledgeable and willing to help. When looking to buy a tennis racquet or ball machine, you are able to demo the equipment through our demo program. The demo program is geared toward the player, and is based on your feedback; therefore, you can be guided in the right direction in purchasing the right racquet for you. At the point of purchase, all of your information is stored in the computer database for future reference. See you on the court! High Country Ski and Tennis is one New Jersey’s premier tennis specialty shops. In existence for more than 27 years, High Country has New Jersey’s largest tennis showroom from March through September, and it is shrunk down in the winter months to focus on skiing and snowboarding. High Country carries the top manufactures and clothing providers in tennis, including Wilson, Babolat, Prince, Nike, Adidas and many more. High Country offers 24-hour racket stringing, grommet installs, re-gripping and free demos. With great customer service and competitive prices, High Country continues to grow each year. For more information, call (973) 994-3630 or visit HighCountrySkiAndTennis.com. Solow Sports is not your typical racket shop! The experience begins with its staff which consists solely of players, coaches and tour stringers to help you find exactly what you are looking for. A vast array of rackets are available from all leading brands, as well as some rare manufacturers that you won’t find anywhere else. You can even test the rackets in the on-site serving cage as they have the largest demo selection on Long Island. When it comes to racket stringing, gripping and customization, Solow Sports is your go-to place. Rackets are always strung on the world’s most advanced machines with knowledgeable stringers who have strung for pros on tour. Have your grips meticulously installed, rackets weighted and balanced, grommets replaced, and more. Racket drop-off is available 24/7 for your convenience, as well as on-the-spot stringing within an hour or less. Get the same professional service as your favorite tour player. Find your favorite apparel brand or try a new local manufacturer with several styles on display. Complete your on-court look with huge selections of bags, hats, footwear and more. As a premier racket sport destination, you will find full equipment lines for platform tennis, racquetball, squash, paddle and even table tennis. The store features a tournament ping-pong table for customers to play. If that wasn't enough, Solow Sports enhances the customer experience with racket pickup and delivery, on-court equipment consultations, custom racket painting, a full racket diagnostic center, tennis elbow and injury assessment, sponsorship opportunities, custom team orders, and so much more. Get what you are looking for to take your game to the next level in-store and online at SolowSports.com. For more than 44 years, Tennis East has been the year-round, full-service tennis store of choice for East End racket sport enthusiasts. Tennis East offers an extensive selection of men’s, women’s and junior’s rackets, apparel, sneakers, strings and accessories for players of all ages and skill levels. More so, Tennis East carries a complete line of 10 and Under Tennis equipment so that kids will have more fun playing tennis. Tennis East carries the most popular and latest product arrivals so that its customers can use the gear that the top tennis pros are using. The store stocks a full-line of Nike, Wilson, Head, Prince products and more. In addition, we have expanded our women’s apparel offering to include several new fashion designers. Allow our knowledgeable and friendly team members to assist you choose the proper new tennis or paddle racquet to elevate your game. Tennis East has an extensive selection of rackets to demo and all daily fee charges will be credited towards your new racquet purchase. Tennis East continues to string all customer and demo racquets on the Wilson Baiardo, which is the state-of-the-art stringing machine on the market. Tennis East is the conveniently located, one-stop shop for all your racquet sport needs. We are committed to providing personalized service, professional advice, competitive pricing and a unique shopping experience. Please look for special offers on Tennis East’s social network sites. For more information, contact us by phone at (631) 283-9535 (Southampton) or e-mail Tennis East at TennisEast@optonline.net. TopSpin Tennis & Fitness is Nassau County’s top tennis specialty shop. TopSpin relocated five years ago and is now centrally located at 218 Jericho Turnpike in Syosset, N.Y., directly across from Syosset Hospital. The second shop is located at the new “State-of-the-Art” tennis complex at Christopher Morley Tennis at the park in Roslyn/Manhasset. TopSpin provides one-hour expert stringing at both facilities. Known as the home of “Clothes for the Pros,” TopSpin has been serving Long Island tennis pros and players with equipment and the top fashion in the sport for more than 30 years. TopSpin’s staff is known for its expertise and high-quality service. You will find all the premier tennis brands of equipment, apparel and shoes at TopSpin for the whole family, including Nike, Adidas, K-Swiss, Asics, Babolat, Wilson, Head, Prince and many more. TopSpin carries the actual outfits and footwear worn at the U.S. Open and other major events by Rafael Nadal and Roger Federer. TopSpin carries a full line of fitness and workout apparel and running shoes, so you can go from the court to the gym in style. Their racket wall contains a large selection of frames, bags and accessories at great prices. Your racket can be strung while you wait. Ask any tennis enthusiast on Long Island and odds are they will be familiar with TopSpin Tennis & Fitness. TopSpin is a great destination for tennis and Mother’s Day gifts as well. TopSpin’s staff will ensure that, with the right equipment, you will reach your highest potential as a player and just as importantly, look great too.